What the American people need to expose and stop is how some people are “ABOVE THE LAW”. Our laws are to protect the people however they don’t seem to apply to some. We hire criminals and give them badges and deadly force everyday. This is not to say we don’y have good police. The problem is when bad cops are exposed we don’t remove them. We move them around, we allow them to keep their benefits, salary, rights and even get rehired to go on abusing people and even committing murder. There is no question this is going on, if a judge is involved in a crime they’re rarely prosecuted or jailed, they’re just moved to another court or allowed to retire with generous benefits and rewards. One only has to look a Los Angeles Superior Court Judge Aviva K. Bobb who was involved in two deaths. She was allowed to retire early and went on to go to work for ARC in Century City CA. This is just one incident there are thousands. If the general public (you or I) committed the same crimes or abuse we’d lose everything, have a record against us and never have the same rights again. We must stop allowing some people to be ABOVE THE LAW. This same excuse is why many of them commit crimes because they know they can get away with murder. Let’s look at State Trooper Elias Montoya who was fired, however not prosecuted for shooting at a van with children. There was no danger but the officer committed several crimes. Yet he is now going to work for another agency which ignores the fact he committed a crime. Imagine that, police departments hiring criminals because they’ve never been prosecuted. Getting the picture yet? Officer Eric Casebolt pulled a gun where there was no danger. He could have pulled his baton, taser. Why did the other officers present not act the same way. 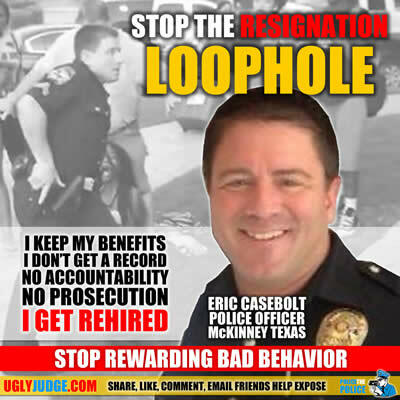 Is Eric Casebolt an example of someone who is the problem? Just because he has no “documented history” or record of problems does not mean he’s innocent. In fact because most abuse and crimes by police is never prosecuted there is no record. In fact many police departments have been proven to ignore reports and fail to file complaints.